Prelude: The author of this article owns several types of cryptoassets, but has no partnership or commercial links with Poloniex & Bitfinex exchanges. Warning: There is no risk-free income. Anyone telling you a different story is trying to steal your money. There are two strong risks to consider carefully: the hacking, or failure, of the exchanges (the history of crypto has shown us that this risk is non-zero) and the fact that your money is “locked” for at least two days, meaning that in the event of a sudden fall in the price of the lended asset, it will destroy all your earnings and the possibility of mitigating your losses. We encourage our readers to manage their capital responsibly and never to put all their eggs in the same basket. Some exchange platforms allow their users to lend their assets out to traders practicing “Margin Trading”. The lenders are then remunerated for performing this service. The purpose of this article is not to provide a full finance course, but simply to share a step-by-step method to automate and optimize a process that may help generate capital gains. If the procedure seems tedious, readers should know that it takes only about ten minutes to set up and that they have almost nothing to do thereafter. Beware: if you use this method, it will theoretically take up to 48 hours to recover your funds when you want to stop the lending process. This method is free, the only cost will be the risk taken (see prelude) and the time you spend on it. Scrupulously follow all of these steps, this is your money at stake, and any small box that remains unticked is a risk that you do not want to take. This procedure applies to all operating systems. This article is an update to my article on Ethereum France (in French) with many updates. A pythonanywhere.com account: Here ! (select a “beginner account,” it’s completely free and although it’s limited, it will be enough for our process). 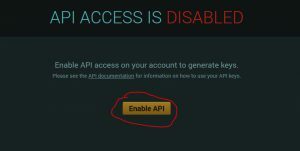 Click on Enable API, that’s the big yellow button! It’s the same process as on Poloniex but now on this other platform. Click on API in your profile bookmark (Personal Account in the top right corner) or follow this direct link (you need to be logged in). 2. Within the “Create new key” bookmark check “write” boxes on “margin funding” & “Wallets”, Give a name to your key. Do not check any additional boxes! 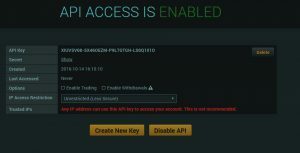 You must submit your 2FA, check your email and click on “create API key” in the received message. Write down your “API Key” & your “API Key Secret” somewhere, as you will soon need it. (Do not give this information to anyone!!! ).This information will never be available after this, so if you lose it, you will need to “revoke” your KEY and create another one. Step 3: deposit assets on your funding accounts. Poloniex side: “Balances” bookmark then click on “transfer balances”, select “exchange” and “funding,” then choose the right amount to transfer. Select the asset within the list, click on it. Copy the “Funding” address, send your assets to this address. Note: Only “audited” accounts may deposit fiat currencies. you can, however, deposit cryptocurrencies, sell them for fiat and lend this fiat if you want. We recommend having your account verified. 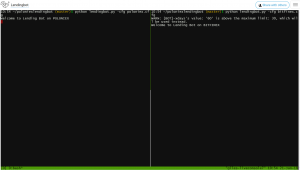 This is the last step and it requires some Linux command line configuration. do not worry, this guide tells you all the steps and gives you the commands to submit. your only job will be to copy and paste. Create your PythonAnywhere.com account follow this direct link, choose the “beginner account” that is free, it’s limited but enough for what we want to do. 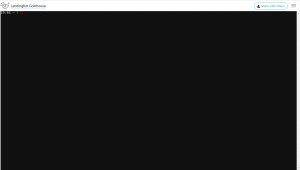 Go to your Dashboard, the direct link is: https://www.pythonanywhere.com/user/username/ with your username instead of “username”. You can name your console if you click on the console name on the top left corner. We will now configure this program, for that we need the API information collected in step 1 & 2. A file opens, to navigate in the file just use the arrows on your keyboard. The “0.005” value represents the minimum interest rate at which you want to “lend” this is at your discretion, it should be noted that these are daily rates if this value is too high you may risk that no one consider your loan proposals, 0.005% per day is about 2% per year, below this rate, it may be better not to lend at all. Your program will always look for the best rate, and if the “market” is below your minimum rate, it will just pause until the situation improves. Replace “YourAPIKey” and “YourSecret” by the credentials written down during step 2. Last Step: Launch the bot! With your keyboard: Ctlr+B % (Ctlr and B keys at the same time then % key). Your screen is now split in two, we will use it to make your assets available on both platforms at the same time. And that’s it, your program will lend the assets you’ll deposit in the “funding” (bitfinex) or “lending” (poloniex) wallets. This program will also lend all interest collected generating that way compound interests. Tip: The up arrow on your keyboard allows you to navigate among the previous commands used, convenient to avoid rewriting the same commands each time. When writing the first article, Poloniex had the best rates, but as of today it is just the opposite, Bitfinex is more profitable, you can follow the average rates on: https://cryptolend.net/rates.html (approximate rates, it is to give you a rough idea, you will never have exactly the same rate). This website proposes to arrange for you the lending process as a service, but we recommend that you do it yourself by following this guide. It is absolutely not mandatory to lend simultaneously on both platforms, this configuration automatically adapts to the funds deposited on the wallets. 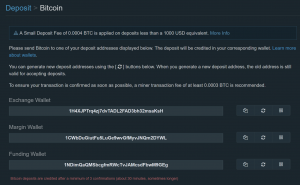 If you only want to make your funds available on Bitfinex for example, keep the same configuration but do not deposit anything on Poloniex wallets. the Poloniex part of the screen will be inactive but always ready when you change your mind. Bitfinex does not particularly encourage programs of this type, your program will display many messages indicating that your I.P has been banned. do not worry, we have setup the program in a way that it is slow enough so the limits of Bitfinex are not reached permanently, you’ll be able to lend without issue. 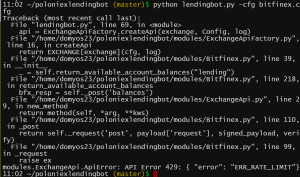 Do not worry, it means that your I.P has been “banned”, wait 15 minutes and restart the program with the command python lendingbot.py -cfg bitfinex.cfg and it will work as intended. Become an informed investor ! Did you enjoy this content ? Catch the best of the fresh news selected by our experts ! Your email is secure, you can unsubscribe at any moment. Thank you for subscribing! We send monthly newsletters. Make sure to check your mails. What is MakerDAO and Dai the new stablecoin in town? How are funds raised through ICOs used? Searching for an information ?